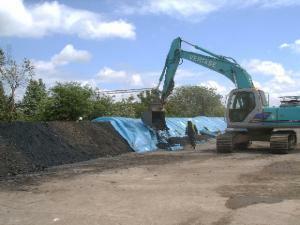 Remediation of contaminated soils and groundwater on a former tank farm and railway siding adjacent to a railway and the River Thames in Purfleet, Essex. Gross hydrocarbon and chlorinated solvent contamination present in both soils and perched groundwater affecting the deeper chalk aquifer and prohibiting redevelopment for high density (up to 17 storeys) residential housing. Site clearance of heavily wooded 6.5 hectare site in close consultation with ecologists and excavation, treatment and disposal of Japanese knotweed infested soils and ongoing treatment of boundary infestations. Temporary diversion of public footpath and termination of large gas main, and demolition of large sub-station. Installation of hydraulically sealed sheet piled cut off wall to prevent cross boundary contamination. 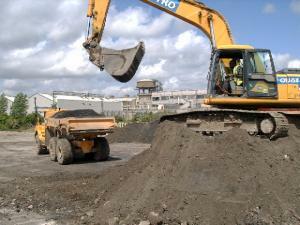 Excavation of approximately 69,000m3 of soils, including removal and re-processing of large buried obstructions, physical processing and segregation of soils prior to bioremediation or reuse. Ex-situ bioremediation of approximately 44,000m3 from over 40,000mg/kg to less than 3,000mg/kg TPH, removal of free phase product and removal, treatment and disposal of contaminated groundwater during earthworks. Installation of a dual phase extraction system to remove free phase product and carry out vapour extraction from contaminated soils left in-situ directly behind sea wall and site re-profiling and re-instatement works ready for new roads, other infrastructure & multi-storey buildings. This was a high profile project and necessitated close liaison and consultation with numerous third parties including no less than three departments of the Environment Agency (Waste licensing, groundwater protection and sea defence), London Port Authority, local Environmental Health, neighbouring landowners and a comprehensive public consultation process.